Angela and Allan are poster kids (literally!) for a sweet, intimate and tiny wedding. Angela and Allan met overseas and believe it or not, Angela continues to live in Saudi Arabia and Allan resides in Poulsbo, WA. But a distance of thousands of miles doesn’t deter these two love birds! 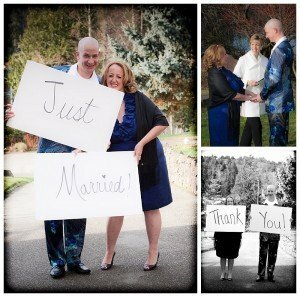 Angela flew in from Saudi and with a little pomp and fanfare, Allan delighted his bride with a planned ceremony and celebration at his home in Poulsbo on the first day of this year. Photographer Kier Smith (who always makes me smile) was on hand to capture the moment. When I received these images, I just smiled – they so capture that “just married moment” on Allan’s front lawn with the warm sun shining down. Angela and Allan – thank you for trusting me sight unseen. I remember your smiles, your smashing blue outfits and your graciousness. May you be together soon!